This article is about the Addison station on the CTA Red Line. For other uses, see Addison#Transit. Addison is a Chicago, Illinois station of the Chicago Transit Authority elevated train line popularly called the Chicago "L". It is located in the Wrigleyville area of the Lakeview neighborhood at 940 West Addison Street with city block coordinates at 3600 North at 940 West. Addison directly serves the Chicago Cubs and Wrigley Field, the city's north side Major League Baseball team and its stadium. The station is served by the Red Line. The station is within the shadow of the historic baseball stadium. Chicago artist Steve Musgrave has several murals featuring Cubs legends on display at the Addison station, which he adopted as part of the CTA's Adopt-A-Station program in 1998. Four large murals feature Cubs legends Billy Williams, Ferguson Jenkins, "Mr. Cub," Ernie Banks, and Ryne Sandberg. A smaller painting of Harry Caray was added later. Since 1998, Musgrave has also designed posters commemorating the annual Cubs–Sox crosstown series. Beginning in 2003, the CTA has also issued farecards featuring the poster design. 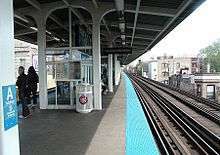 Prior to 2007, southbound afternoon Purple Line Express trains stopped at the station before weekday evening Cubs games, to speed travel times for customers from Evanston, Skokie and Wilmette. In an effort to prevent delays due to Brown Line construction just south of the station, Purple Line Express trains now stop at the nearby Sheridan station instead. Following Cubs games, this station can become overcrowded and jammed with people trying to get on the trains. Until 2016, AM Loop-bound Purple Line express trains shared 95th-bound Red Line tracks and stopped at Addison. This is due to the Wilson reconstruction. ↑ "Boys Meddle with "L" Track". Chicago Daily Tribune. June 7, 1900. p. 12. ↑ "Annual Ridership Report – 2015" (PDF). Chicago Transit Authority Ridership Analysis and Reporting. January 13, 2016. Retrieved May 29, 2016. ↑ Red Line Customers Score a Commemorative Poster at Cubs–Sox Crosstown Series. Chicago Transit Authority. 2003-06-19. Retrieved on 2010-07-03. ↑ Cubs–Sox Crosstown Series – CTA Connections – June 2010 – Chicago Transit Authority. Chicago Transit Authority. 2010-06-01. Retrieved on 2010-07-03. ↑ CTA to Issue Commemorative Fare Card For Cubs–Sox Crosstown Series. Chicago Transit Authority. 2003-06-02. Retrieved on 2010-07-03. ↑ CTA Provides Service to Wrigley Field This Baseball Season. Chicago Transit Authority. 2007-04-05. Retrieved on 2007-05-21. 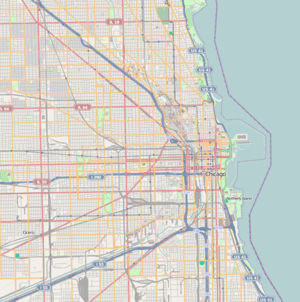 Wikimedia Commons has media related to Addison (CTA Red Line).